Approaching your exterior space with a pressure washer can do more harm than good without the proper tools and training. 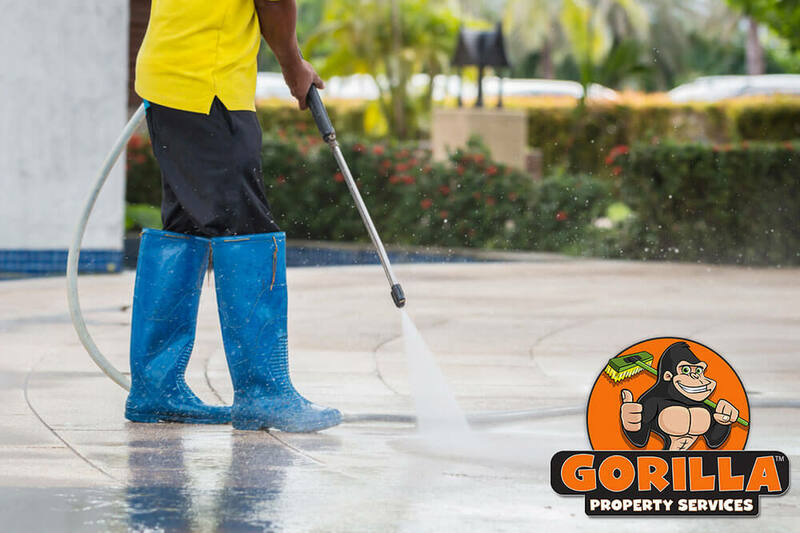 Don’t risk unnecessary damage to your home or business, call our Gorillas instead. Each and every one of our Gorilla technicians is an expert when it comes to your Lethbridge pressure washing service. Don’t hesitate to enlist the best in local, reliable service. Stains and discolourations are easy to acquire but difficult to get rid of. Climates in Lethbridge can be difficult to predict, having dust and dirt pushed up onto your walls or patios is a daily occurrence, as is salt staining, natural debris and bird droppings. There are a million and one ways to spot clean the area surrounding your property. Exterior spots can be scrubbed here and there but it takes a bit of pressure in order to get a full-clean. That is where it becomes so important to have the right property maintenance team in your corner. Contrary to what you might have seen on television or in movies, pressure washing is more than simply pointing and shooting. In fact, improper pressure washing is responsible for daily instances of property damage all across the Lethbridge area. By enlisting a professional for your Lethbridge pressure washing, you eliminate the risk of damage while getting the clean look that you want. A proper Lethbridge pressure washing begins with an application of our eco-friendly cleaning solution. This solution lifts the top layer of dirt and debris, in order to achieve a deep-clean. Even though our solutions are environmentally sound, you don’t want them leaking into an viable water sources. That is why our Gorillas come prepared with drain guards in order to protect any water outlets in the immediate area. Once this is completed, affected areas are brushed clean and then pressure washed to remove any remaining dirt or discolouration.